Bulla, Wesley A. (2003). Daily Noise-Exposure of Audio Engineers: Assessment of Daily Noise-Exposures of Professional Music-Recording Audio Engineers Employing OSHA PEL Criteria, MEIEA Journal Vol 3 No 1, 55-83. The author acknowledges some readers may not recognize terminology specific to the investigation of noise exposure and OSHA defined criteria. In order to help the reader through unfamiliar territory, a list of definitions is provided at the end of this article. While audio engineering is not directly listed as a high-risk occupation, it is commonly presumed that many audio and music engineering professionals, such as those employed in recording studio activities, listen to music for prolonged periods of time often at excessive sound levels. However, previous studies of cumulative exposure to loud music and its effect on HL have focused almost entirely on live-performance musicians, conductors and directors of band and orchestral ensembles, and their audiences. Unfortunately, there is a general lack of data regarding noise-expo-sure among non-performance-oriented music industry professionals, such as recording engineers, technicians, and music producers. A search of the Medline PubMed database lists 186 publications concerned with music-related HL or NIHL in the music professions.3 None of these studies involve exposure levels of audio engineers, music producers, or other non-performance-oriented professionals in the audio and music recording industries. To date, there have been no empirical studies of noise exposure levels among “behind-the-scenes” non-musician participants in audio- and music-recording activities. The working audio engineer is the focus of the present study. 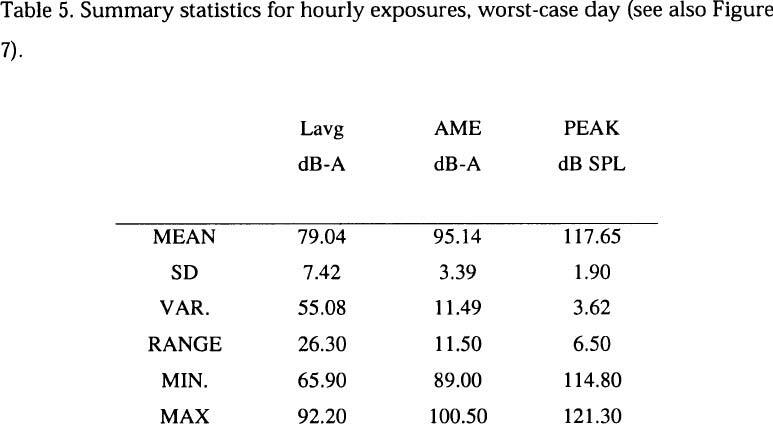 We documented work-related sound exposure levels of ten professional music recording studio engineers during their daily activities and accumulated over 400 hours of data revealing peak, maximum, and average sound pressure level (SPL) exposures. It should also be noted that while scientists generally agree that TTS and HL may be plausibly related and inherently linked, their connection, as well as an individual’s susceptibility to NIHL, is difficult to determine and their precise relationship is still unclear. Unfortunately, individuals who are experiencing TTS, or are in the early stages of mild HL, are often unaware of its presence.7, 8 This lack of self-awareness at the onset of TTS or NIHL, in addition to making assessment difficult, is an indication of the insidious and covert nature of NIHL. In an effort to understand the effect of exposure to loud music, Axelsson and Lindgren9, 10 examined pure-tone hearing thresholds in a population that included disk jockeys, entertainment artist managers, live-sound engineers, and musicians. They found HL demonstrated in 13 to 30% of their populations. 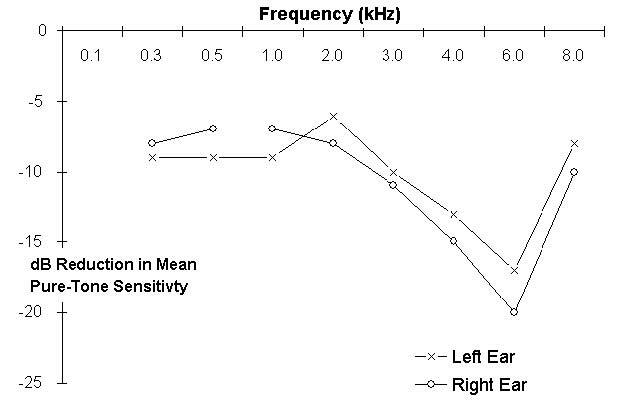 Interestingly, as shown in Figure 1, TTS examinations conducted by Kvaerner’s research team in an ironworks factory revealed hearing sensitivity thresholds reduced in the same frequency bands (4 and 6 kHz) as those observed in the music professionals studied by Axelson and Lindgren.4 This observation provides evidence that prolonged or repeated exposures to loud music in common performance and listening environments may have the same impact as industrial noise in the workplace. Over the past thirty years, scientists have exhibited varied degrees of concern as to whether exposure to loud music, especially the rock genre, would result in music-induced hearing-loss (MIHL) that has similar characteristics to NIHL. In 1972, Barry and Thomas12 conducted an investigation to determine if noise and music could possibly result in similar levels of TTS, and therefore, similar types of NIHL. After an exposure of 60 minutes to 95 dB (linear) of white noise, rock music, or symphonic music their subjects demonstrated an average TTS for the noise stimulus that was greater than the average for either music stimulus. Shifts in lower frequencies (750 - 2000 Hz) were similar across conditions. 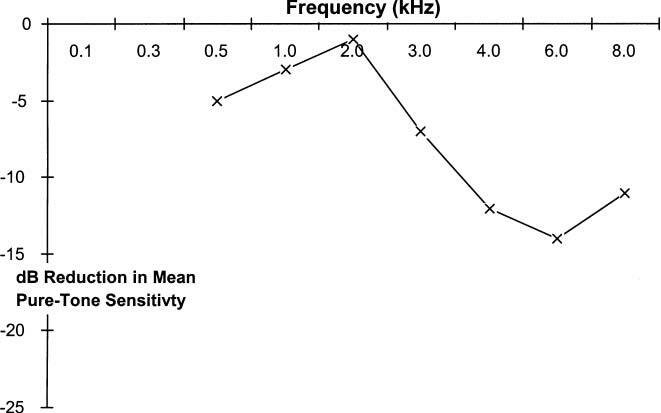 However, shifts in higher frequencies (2 - 5 kHz) were 3 to 7 dB greater for the noise stimulus. Additionally, they found large variations across subjects, but consistency within subjects. That is, if a subject had large measures of TTS for one stimulus, s/ he also demonstrated large measures for the other two stimuli. Interestingly, several subjects complained that the symphonic music was too loud even though all three stimuli had equal average intensity levels. While the Barry and Thomas study seemingly provides evidence that music has a lesser effect on TTS than noise, it must be noted that their noise stimulus contained equal energy per band and therefore had greater energy content in the higher frequency bands when compared to their music program. More importantly, their study provides testament to the covert quality of excessive noise exposure, in that even though their noise stimulus contained greater energy in the spectral bands normally associated with auditory fatigue, several subjects went to sleep while listening to the noise stimulus. As noted by Barry and Thomas, this is disturbing because subjects in general found the potentially more dangerous stimuli to be the least bothersome. Recently, Dibble13 published a concise review of related noise- and music-induced HL literature in an attempt to ascertain the relationship between exposure to loud music and HL. While there is evidence that many music professionals suffer from some form of HL, there is still much debate as to whether extended exposure to loud music and noise result in the same levels and types of damage to the sensory organ. Dibble reported that the weight of evidence suggests that music does not have the same effect as industrial noise. He also reported, as a subjective note, that due to frequency content, he did not experience stress while listening to music at average levels of over 100 dB (no indication of weighting), while he did with industrial noise levels of 92 - 96 dB-A. Due to differences in spectral content, transient variations, or some other acoustic factor(s), when compared directly to some types of noise, it is plausible that our sensory organ may tolerate greater average levels of music before damage occurs. If this is true of the general population of audio professionals, it is also possible that they are more prone to expose themselves to greater levels of music for greater periods of time because they find it less disturbing than noise per se. Over the years there have been many studies examining exposure levels and HL among musicians. While not consistent in methods of documentation, most have noted high SPL at both rehearsals and concert performances and many have documented some degree of hearing impairment among musician populations. Consistent with results found with industrial workers, two and one-half hours of unprotected exposure during rehearsals caused TTS of 15 dB, 25 dB, and 20 dB at 2 kHz, 4 kHz, and 6 kHz, respectively, among musicians in a rock and roll band.13 All of the subjects examined by Axelsson and Lindgren demonstrated HL in excess of 30 dB in at least one frequency band in at least one ear.11 Of their ten “worst case” musicians, the mean HL between 3 and 8 kHz was shown to be greater than 20 dB. The impact of excessive sound level exposures on musicians is not limited to the pop and rock genres. School band directors have exhibited similar levels of TTS and HL. Cutietta, Millin, and Royse found 66% of their population exhibited signs of HL at one or more of the tested frequen-cies.15 Thirty-four percent of those were attributable to NIHL (as opposed to age-induced HL). A more disturbing finding revealed band directors under 30 years of age exhibiting HL normally associated with a population of about 50 years of age. Audiometric surveys were conducted at the 51st Audio Engineering Society (AES) Conference and at a meeting of the Los Angeles section of the AES.19, 20 The two surveys involved 480 professionals in the recording industry. The authors of the earlier study found that 10% of the participants demonstrated a moderate to severe HL at 4000 Hz. Results of the later study suggested a small but consistent HL which could not be attributed to age-related factors. 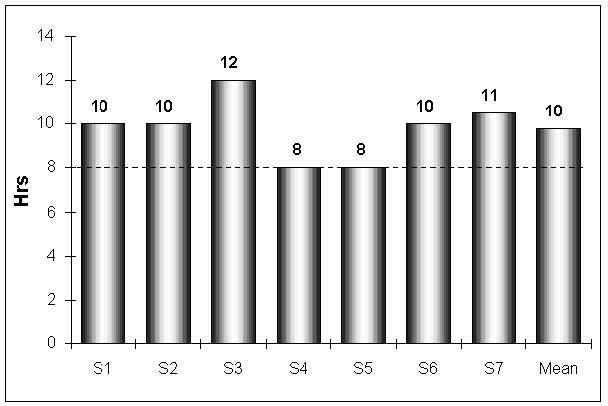 As shown in Figure 2, average pure-tone thresholds of 100 recording engineers show hearing sensitivity thresholds reduced at 4, 6 and 8 kHz—the same “notch” found in industrial workers (see also Figure 1). Audio facilities typically utilize loudspeaker systems that are capable of generating sustained SPL in excess of 110 dB-A at a listener’s position. Specifications of several popular full-range near-field loudspeaker systems claim peak impulse capabilities of up to 123 dB SPL over a broad bandwidth of 39 Hz to 22 kHz (+/-1.5 dB).23, 24, 25 No tests were conducted to verify the validity of manufacturers’ published claims. However, it is clear that recording engineers, like musicians, have equipment available that is capable of generating dangerous levels of sound. The Gilman, et. al. audiometric survey of recording engineers, where reduced hearing sensitivities with similarities to steel workers were demonstrated, combined with the knowledge that there is equipment available capable of generating potentially dangerous SLP at a technician’s or engineer’s listening position, leads to the suggestion that recording engineers may potentially be exposed to excessive levels of sound throughout their careers. To date, this author knows of no study that has documented actual SPL exposures of audio technicians involved in music recording activities. The focus of the present study was to investigate the extent to which professional audio engineers are exposed to excessive sound levels. The study began by asking a simple, yet profoundly important, question: are audio engineers, while participating in music recording activities in professional studio music-recording environments, exposed to potentially harmful levels of sound as defined by current OSHA guidelines for daily occupational noise exposure? In specific terms, what is the extent of noise exposure during a “typical” workweek of the professional audio engineer? Ten professional audio engineers served as subjects. Each subject participated for one week (five working days) of activity. All were male and ages ranged from the mid 20s to the mid 40s. By self-report, all participants claimed “normal” hearing. Several types of recording sessions and facilities were represented in varying degrees including: tracking, over-dubbing, mixing, and mastering. All recording facilities were professional “for hire” studios with diverse clientele ranging from publishing demos to master recording sessions. A Quest Q-400 programmable noise dosimeter was used for raw data collection. The dosimeter is capable of maintaining accuracy for many months; even so, calibration checks were made weekly, before and after the collection of each subject’s data. All verifications of accuracy were made at 114 dB SPL as per ANSI S1.40-1984 standards. No discrepancies (+/- 0.1 dB) were noted between calibration checks during the study. Subjects were encouraged to go about their daily activities without regard to the study. Because “down time” and breaks, such as set-up and striking of studio equipment, making reference copies for clientele after the actual recording session had ended, or lunch and dinner breaks impact overall noise exposure estimations for any given day of activity, data were also collected during these periods. Subjects were asked to keep a written log of activities for each workday. Logs included brief entries stating the time of a noted event, such as the start and end of recording sessions along with a short description of the activity, (e.g. tracking, overdubbing, mixing, tape copies, etc.). Diary entries were used as a reference for the comparison of activities in relation to observed SPL. During the study, no feedback was given. All sound exposure data were collected via an omni-directional ceramic microphone supplied with the dosimeter. The microphone was used as a “personal monitor” and was attached by the supplied clip to the subject’s shirt in his shoulder area as recommended by the manufacturer and to the dosimeter via a cable.21The dosimeter CPU was then attached to the subject’s belt. A foam windscreen was placed on the microphone in order to mini-mize the possibility of error from air impact due to the subject’s movement about the studio. The noise dosimeter was set to a sample resolution of 125 ms and programmed to calculate the mean of every eight samples resulting in one data packet per second. All data packets were time-stamped and recorded to the dosimeter’s internal memory at one-minute intervals. 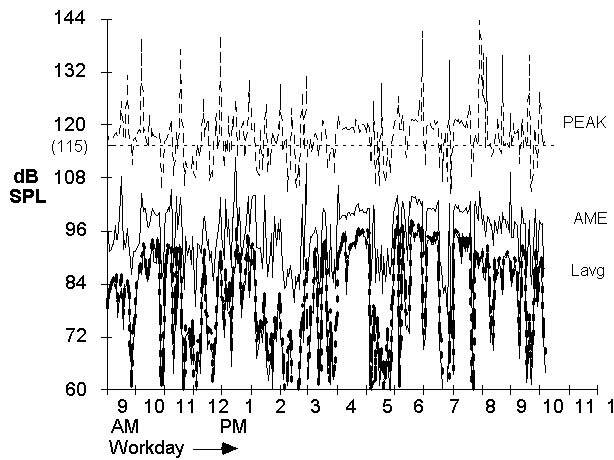 Each workday was then recorded as a single event with 60 data packets per hour. Once the dosimeter had been started, it was allowed to run for the entire day of activities. At the end of each workday, the data packets were uploaded to a Dell Pentium computer for storage and analysis. 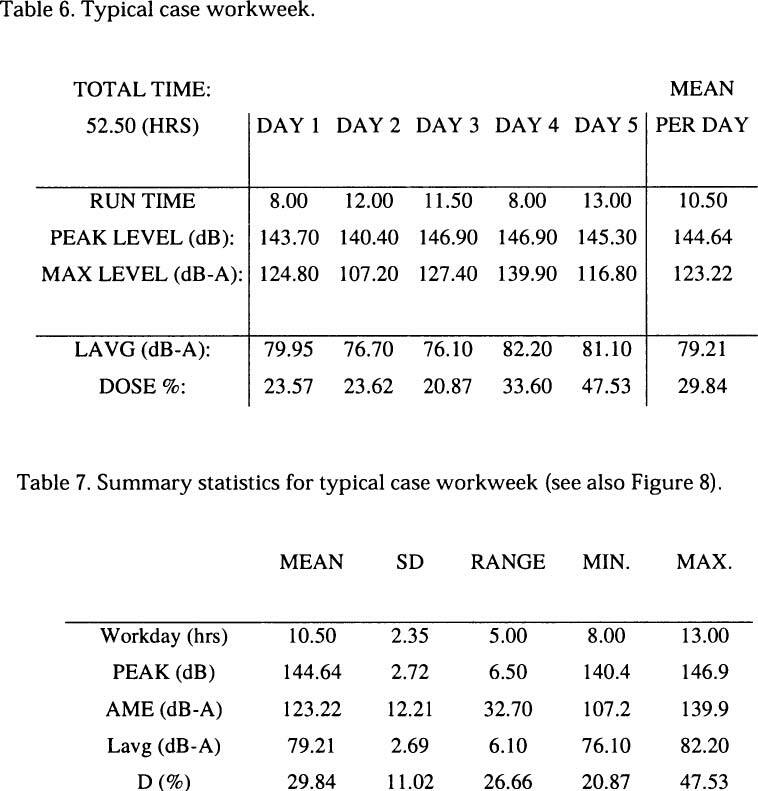 After a determination of validity, SPL data were analyzed for: (1) average continuous level (Lavg); (2) un-weighted peak levels (PEAK); (3) average maximum exposure levels (AME); (4) daily noise dosage (D); and (5) time-weighted average exposure levels (TWA).1, 22, 26, 27 These five parameters of SPL analysis allow one to make a determination of the relative degree of noise exposure. Lavg provides a comparison of exposure levels found in audio recording facilities to those found in other industries. D provides calculated dosage exposures of subjects while working in audio recording facilities. 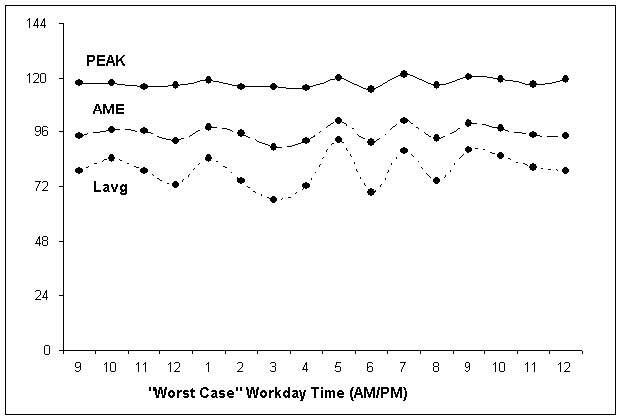 PEAK and AME pattern analysis indicate which activities may be hazardous over relatively short intervals of time (less than the standard eight-hour workday). Finally, TWA allows us to determine relative exposures over a typical working period of music recording activities where sound levels may vary from reasonably safe to potentially hazardous. No secondary calculations were necessary for PEAK and AME estimations. These data represent actual observations for a given time period. Lavg, D, and TWA computations were obtained from the following equations. where: rtime = total time of observation interval in seconds. Lavg was then collapsed and averaged at three-minute intervals over the entire workday. Note that for an eight-hour time period where SPL is constant, the TWA is equal to the observed SPL. Correspondingly, for constant SPL stimuli, if the time period is less than eight hours TWA < Lavg; if the time period is more than eight hours, TWA > Lavg. The focus of the present study was to gather data that may illuminate the extent and degree to which professional audio engineers are exposed to excessive sound levels on a daily basis. Included here are seven of ten subjects. Two are excluded because of invalid data that was apparently corrupted during the process of recording. One subject was excluded because he was the only mastering engineer to complete the study, and, his results were so drastically different from the others it was concluded that he, or mastering per se, may be a unique work environment within the music recording community. Therefore, results here represent seven recording engineers working under similar conditions including varying degrees of tracking, over-dubbing, and mixing in both large and small studio environments. 71% of our subjects claimed to have “more than average” exposure; 29% admitted to “ringing” in the ears after a normal workday; and 86% claimed to use hearing protection when exposed to excessive noise levels. However, 71% believed that hearing damage begins at levels above 100 dB SPL and 14.5% each thought 80 and 90 dB SPL were levels where hearing damage occurs. None of the recording engineers knew the OSHA recommended PEL; and 29% believed it is possible to repair hearing after damage. 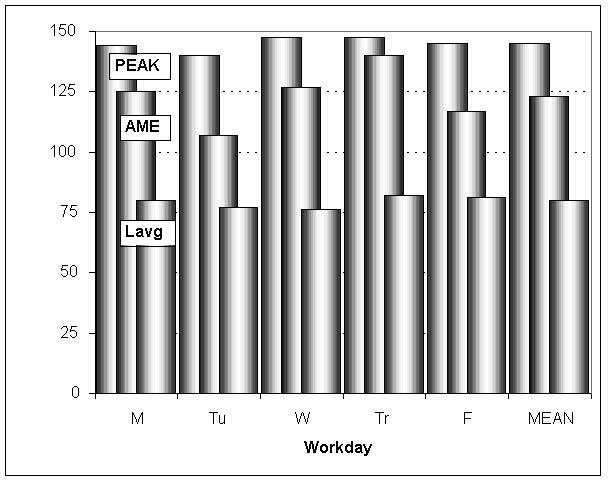 Workdays averaged from eight to twelve hours with a mean across subjects of ten hours per day (SD = 1.46) (see Figure 3). As shown in Figure 4, the un-weighted, full-bandwidth instantaneous peak SPL (PEAK) that occurred during observation ranged from 123 to 145 dB across subjects. The highest A-weighted SPL, known as the average maximum exposure (AME), which occurred during observation ranged from 106 db-A to 123 dB-A. The average sound level for each measurement period (Lavg) was calculated to be between 68 and 87 dB-A. 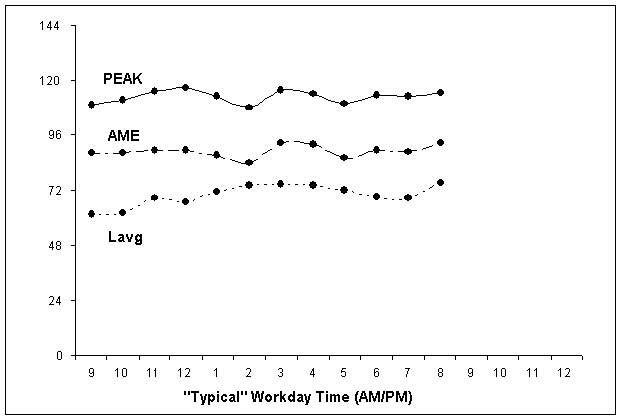 Because all subjects recorded at least eight-hour workdays, the time-weighted averages (TWA) were nearly identical to Lavg estimations. Dosage (D) calculations ranged from 12% to 57% (see Figure 5). Mean PEAK SPL across subjects was 134 dB (SD = 8.5); mean AME was 112 dB-A (SD = 5.7); mean Lavg was 81 dB-A (SD = 6.0); and the mean D across subjects was estimated at 42%. Figure 3. Average workday (Hrs) by subject. Workdays ranged from 8 to 12 hours with a mean of 10 hours. Figure 4. 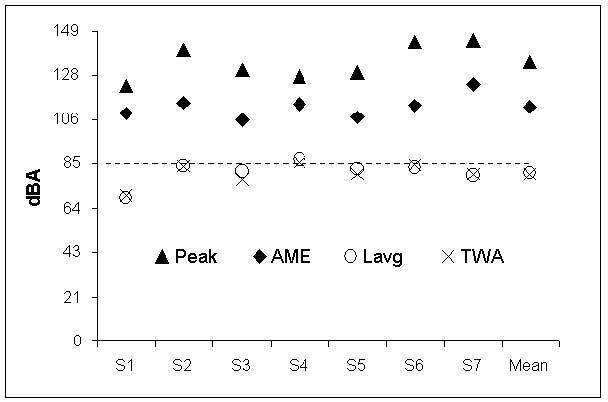 Observed peak SPL (PEAK), average maximum SPL (AME), and calculated mean SPL exposures (Lavg & TWA) by subject. Figure 5. Noise exposure dosage calculations (% of D) by subject. exposure for this workday at 126%. This subject’s workday was almost twice the normal eight-hour workday with the average dB SPL exceeding the 100% criterion standard at approximately 92 dB-A. OSHA criterion for worker protection in industry states that continuous noise above 115 dB-A of any duration is not permitted. 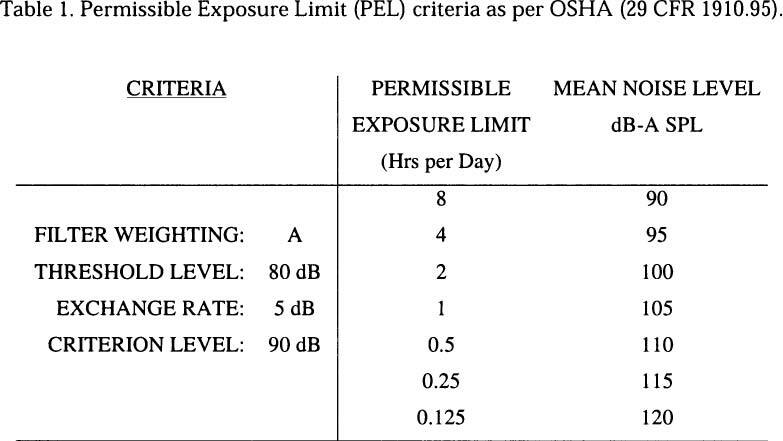 Note that the AME for this subject is only 2.5 dB below the OSHA maximum allowable level and, as shown in Figure 6, PEAK SPL generally remained at or above 115 dB for most of the workday. Upon analysis, we found 214 three-minute periods, 70% of the workday, where peaks exceeded the OSHA maximum allowable level. Figure 6. A “worst-case” observation (see also Table 2). This recording engineer exceeded OSHA criteria for acceptable levels of noise exposure in a given workday. Note that peak SPL generally remained at or above 115 dB SPL and AME remained above 96 dB-A SPL. The two most extreme hours are shown in Tables 3 and 4 below. During the time-period between 6:37 and 7:37 PM (Table 3), PEAK SPL remained above 119 dB (SD = 5.27) for each three-minute period observed. The mean AME and the mean PEAK SPL were 101 and 121 dB respectively. AME remained at approximately 100 dB-A (SD = 3.51) with levels below 100 dB-A occurring for only six minutes of the hour. Thirty minutes later, between 8:07 and 8:43 PM (Table 4), AME and PEAK again averaged 101 and 121 dB SPL respectively with PEAK remaining at 120 dB SPL (SD = 1.30) or greater for all but six of the 36 minutes. 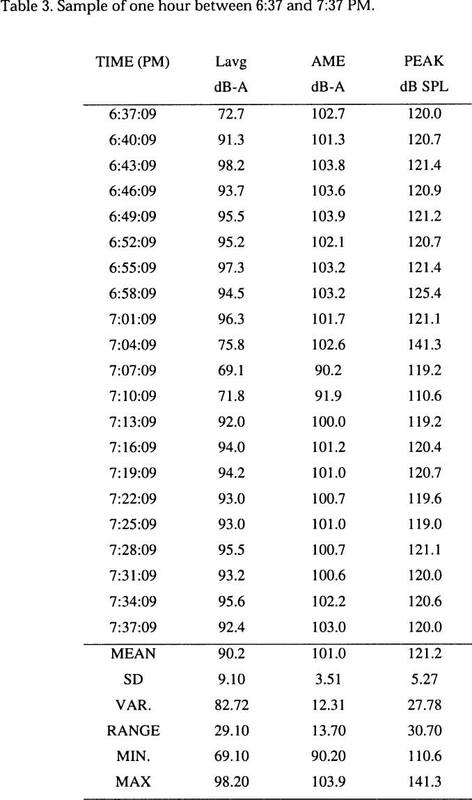 During those six minutes, PEAK SPL dropped only about 1 dB to 119.4 and 119.6 dB SPL for each three-minute period. Lavg was calculated at 90 dB-A SPL for the former time period and 94 dB-A SPL for the latter time period. Lavg ranged from 66 dB-A to 92 dB-A SPL. The per-hour AME ranged from 89 dB-A to 100 dB-A SPL and the per-hour PEAK ranged from 115 dB to 121 dB SPL. 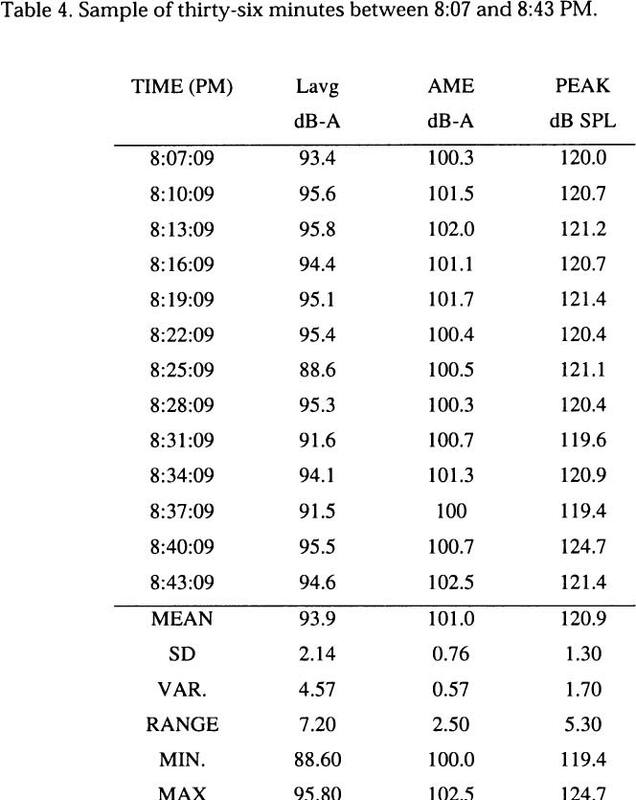 When collapsed to an hourly basis (see Table 5 and Figure 7), PEAK SPL averaged 118 dB (SD = 1.9, var. = 3.62); AME aver-aged 95 dB-A SPL (SD = 3.4, var. = 11.5); and Lavg was calculated at 79 dB-A (SD = 7.4, var. = 55) per hour. Figure 7. A “worst-case” observation collapsed to an hourly basis. were very similar to the mean of the entire group and daily exposure levels tended to fall in the median between the two extremes of total over-expo-sure and negligible exposure. hours per day. On any given day, PEAK SPL were noted that ranged from 140 to 147 dB SPL with a mean PEAK of 145 dB SPL (SD = 2.72 dB). AME ranged from 107 to 140 dB with a mean of 123 dB SPL (SD = 12.2 dB). Mean Lavg and D for the workweek were calculated at approximately 80 dB-A SPL and 30% respectively. Daily exposures varied greatly and ranged from a low of 21% to a high of 48%. Figure 8. A “typical-case” observation across the workweek. Figure 9. A “typical-case” workday collapsed to an hourly basis. produce HL after many years of repeated exposure. In keeping with this perspective, when evidence suggests employees may be regularly exposed to a noise dosage of 50% or greater (i.e., 85 dB-A SPL), OSHA requires employers to maintain a hearing conservation program that includes training in the use of hearing protection and procedures that ensure protection is used regularly by employees. Employers are also required to provide yearly audiometric examinations by a licensed audiologist and to maintain strict records of those examinations for the duration of the employee’s tenure and for two years thereafter. If an employee’s audiometric examinations demonstrate the possibility of permanent threshold shift, known as Standard Threshold Shift (STS), requirements become more stringent. Employers must then provide “more effective hearing protectors” that further reduce exposures by another 5 dB to 85 dB-A (TWA) for those employees exhibiting STS.22, 27 OSHA regulations, while in keeping with the NIH perspective, unfortunately facilitate the assumption that should HL be demonstrated, then action should be taken to reduce the possibility of further permanent damage—clearly, a wait-and-see disposition that carries a caveat for individuals dependent upon their hearing to earn a living. Three of the seven recording engineers observed here met CFR 1910.95 criteria for required use of hearing protection and required hearing conservation monitoring. One additional engineer missed the criterion by only 2.2% with a dosage of 47.8%. The music-recording profession is unique in that the recording engineer is required to use his or her hearing as a working tool. Because of this, it is difficult, if not impossible, to wear some sort of hearing protection while working in a music-recording studio. As a confirmation that our subjects may be experiencing shifts in hearing threshold or fatigue from over-exposure, one-third of our subjects admitted to “ringing in their ears” after a normal workday. Even so, none of the seven music-recording engineers in this study exceeded OSHA criteria for noise exposure during their working activities. In fact, the composite average across subjects appeared to skew results toward the conclusion that music-record-ing engineers work in conservative and safe environments with little or no risk of hearing damage. However, individual data, as per our “worst case” observation, indicated this may not be the case and exposures may vary greatly from individual to individual and from day to day. As with many other medical and health related investigations, it seems more beneficial to examine exposures on an individual basis, as recording engineers apparently may be exposed to excessive SPL on any given day and not another. Because TWA, Lavg, and D estimations are based on assumptions that generally discount the importance of quicker transient exposures where time values tend to be extremely short, they are best applied in environ-ments where noise remains more or less constant. An analysis of PEAK data is important because loud acoustic impulses may carry unusual amounts of energy that may have potential for causing instantaneous and irreparable damage to the hearing mechanisms. There is general agreement among scientists that activities with repeated exposures to loud transients, such as sport shooting or hunting with firearms, are detrimental to hearing health. In the workplace, OSHA sets an allowable limit of a single 115 dB peak-transient exposure for any time period during a workday. It should be noted that “PEAK data” in this study represent the single highest instantaneous transient of less than 1000 ms recorded during each time period. This transient could have appeared only once or any number of times for that period of data collection. The only way to truly know the extent of transient-peak exposure levels is to look at a minute-by-minute analysis as shown in Tables 3 and 4 above. Closer inspection of the data reveals that peaks in excess of 114 dB SPL occurred within every three-minute time period for these two examples. Those patterns were also observed throughout all other subjects’ data suggesting that high-energy transient peaks may be a regular occurrence in music recording (see Figures 6, 7, and 9). If so, one must ask, are TWA, Lavg, and D estimations, as well as current standards for exposure limits, adequate for application to the mu-sic-recording professions? Results from previous studies such as those by Schneider; Axelsson and Lindgren; Gilman, Kamm, and Dirks; and Martinez and Gilman suggest music recording engineers may be at risk for hearing loss over a lifetime of involvement in music recording. When applying OSHA exposure criteria, music-recording engineers surveyed here were shown to monitor audio program material at sound pressure levels that are regarded as safe, but understood to be potentially dangerous over the long term. In general, the music-recording engineers involved here do not seem to be in immediate danger of developing NIHL. Evaluating the impact of long-term noise exposure is an arduous process that involves many hours of environmental investigation in concert with analyses of audiometric examinations. Unfortunately, there is no direct way to measure the onset of hearing loss. Therefore, we settle for measuring hearing threshold and environmental noise exposure and attempt to make predictions from those measurements. This study has been a first attempt to document daily noise exposures of working audio engineers in their everyday studio environments and to examine those exposures according to currently accepted standards of industrial noise-impact assessment. After examining this study’s observations, the question must be raised of whether or not, for professionals in the music-recording industry, current assessment standards are adequate indicators of the dangers of noise exposure in the recording studio. There is much work to be done in several areas of hearing conservation in the music-recording industry, such as developing standards that extend current definitions of noise exposure and audiometric assessment to recognize the music-recording professional’s need to maintain acute hearing in order to earn a living. Hopefully this study will help serve to raise the awareness of the complexities of the assessment of the impact of long-term noise exposure on hearing, as well as the awareness of hearing conservation within the music-recording industry. Average sound level (Lavg): the average sound level for a measurement period based on a defined exchange rate (ER) of 4, 5, or 6 dB. A-weighting: Used in reference to sound pressure level (SPL) measures where human sensitivity to frequency spectrum is taken into account. Criterion level (CL): the constant sound level that, if applied for 8 hours, would accumulate a dosage (D) of 100%. 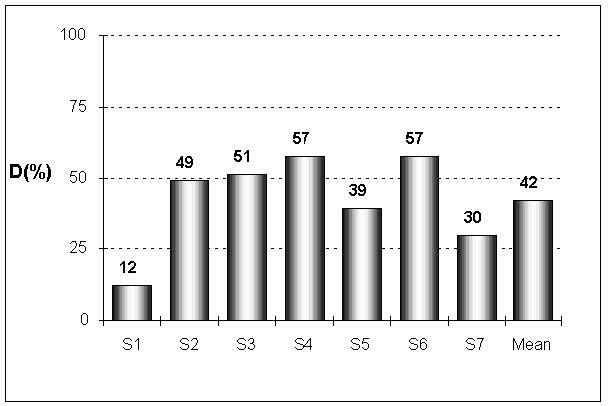 Dosage (D): expressed as a percentage of the maximum allowable daily criterion level (CL). Exchange rate (ER): the number (in dB) that the average SPL must change in order for the rate of dose accumulation to be either halved or doubled (e.g. If: 100% dose = 90 dB for 8 hours and the exchange rate = 5 dB; then, a 100% dose would be accumulated if exposed for 4 hours at 95 dB or for 16 hours at 85 dB). Maximum exposure levels: the highest A-weighted SPL that occurs during a given time period. For our analyses these are averaged over a set time period and recorded as “Average Maximum Exposure Level” (AME). Sound level in dB (LS): used to calculate Lavg, entered only when the SPL is greater than the defined threshold level (TL). Sound pressure level (SPL): a ratio measure of sound intensity with a reference where “0 dB SPL” is defined as the softest sound perceptible by average human hearing acuity. Stated in reference to 0.0002 dyne/cm2 , often listed as 20 µPa. Threshold level (TL): a preset level below which sound is not accumulated or included in average SPL (Lavg) calculations, time-weighted average exposure (TWA), or dosage (D) estimates. 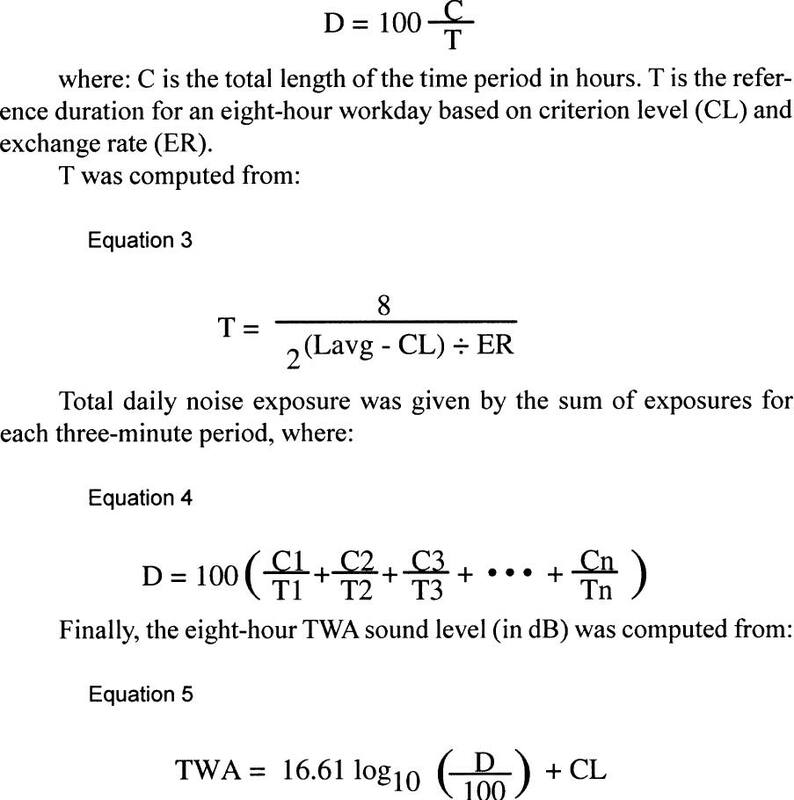 Time-weighted average (TWA): the sound level that is accumulated for any time period but with its average level computed over an eight-hour time period. Un-weighted peak levels (PEAK): the highest observed un-weighted, full-bandwidth instantaneous (<1000 ms) peak SPL that occurs during a given time period. Many thanks to Dr. James W. Hall, III; all of my subjects, including the reluctant ones; to the Vanderbilt Bill Wilkerson Center for Otolaryngology and Communication Sciences, Vanderbilt University Medical Center, Vanderbilt University, Nashville, Tennessee; to the Center for Music Business, Curb School of Music Business, Belmont University, Nashville, Tennessee; and to the late Bob Mulloy, (Associate Dean, Mike Curb Music Business Program) for finding the funds to buy the dosimeter. Bloom, S. (1997). “Hearing conservation—emerging trends, and technologies.” The Hearing Journal, 50(7), 21-30. NIH (1990). 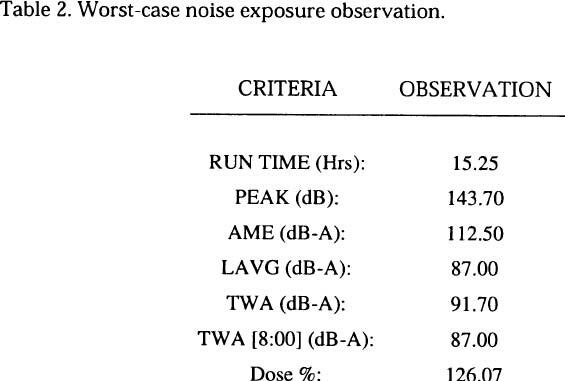 “Noise and hearing loss.” NIH Consensus Statement 1990 Jan. 22-24, 8(1), 1-24. Bulla, W. A. (1998). WWW Medline PubMed electronic search: (hearing[All Fields] AND loss[All Fields]) AND music[All Fields]). May 2, 1998. Kvaerner, K. J., B. Engdahl, A. R. Arnessen and I. WS. Mair. (1995). “Temporary threshold shift and otoacoustic emissions after industrial noise exposure.” Scand. Audiology, 24(2), 137-141. Schneider, J. (1976). “Music, noise, and hearing damage.” S. African Med. J., 50(47), 1912-1914. Lindgren, F. and A. Axelsson. (1983). “Temporary threshold shift after exposure to predicted and unpredicted noise.” Scand. Audiology, 12(4), 241-244. Henderson, D., M. Subramaniam and F. A. Boettcher. (1993). “Individual susceptibility to noise-induced hearing loss: An old topic revisited.” Ear & Hearing, 14(3), 152-168. Yassi, A., N. Pollock, N. Tran and M. Cheang. (1993). “Risks to hearing from a rock concert.” Canadian Family Physician, 35, 10451050. Axelsson, A. and F. Lindgren. (1981). “Pop music and hearing.” Ear & Hearing, 2(2), 64-69. Axelsson, A. and F. Lindgren. (1977). “Does pop music cause hearing damage?” Audiology, 16, 432-437. Axelsson, A. and F. Lindgren. (1978). “Hearing in pop musicians.” Acta Otolaryngol, 85. 225-231. Barry, J. P. and I. B. Thomas. (1972). “A clinical study to evaluate rock music, symphonic music and noise as sources of acoustic trauma.” J. Audio Eng. Society, 20(4), 271-274. Dibble, K. (1995). “Hearing loss and music.” J. Audio Eng. Society, 43(4), 251-266. Rupp, R. R. and L. J. Koch. (1969). “Effects of too-loud music on human ears but, Mother, rock’n roll has to be loud!” Clinical Pediatrics, 8(2), 60-62. Cutietta, R. A., J. Millin and D. Royse. (1989). “Noise induced hearing loss among school band directors.” Bulletin: Council for Research in Music Education, 101, 41-49. Nodar, R. H. (1993). “Hearing loss in a professional organist: A case study.” Medical Problems of Performing Artists, 8(1), 23-24. Behroozi, K. B. and J. Luz. (1997). “Noise-related ailments ofperforming musicians: A review.” Medical Problems of Performing Artists, 12(1), 19-22. Axelsson, A., A. Eliasson and B. Israelsson. (1995). “Hearing in pop/rock musicians: A follow-up study.” Ear & Hearing, 16(3), 245253. Gilman, S., C. Kamm and D. D. Dirks. (1976). “Preliminary resultsof the 1975 AES audiometric Survey.” J. Audio Eng. Society, 24(6), 455-460. Martinez, C. and S. Gilman. (1988). “Results of the 1986 AES Audiometeric Survey.” J. Audio Eng. Society, 36(9), 686-690. Quest Technologies. Instructions for Q-400 and Q-500 Noise Dosimeters, 56-253 REV.E 9/95. Mackie Audio Products, Inc.(1998). “Powered Near-field Audio Monitor Technical Specifications.” http://www.mackie.com/Products/ Specifications/HR824 Specs.html, Thur., May 7, 1998, 10.50 PM. KRK Systems, Inc. (1998). “Loudspeaker Models E7 and E7Technical Specifications.” http://www.krksys.com/expose.htm, Thur., May 7, 1998, 10.50 PM. Suter, A. H. (1993). “Hearing Conservation Manual” (3 rd ed.). Council for Accreditation in Occupational Hearing Conservation (CAOHC), Milwaukee, WI 53202. Occupational Safety and Health Administration (1983). “Occupational Noise Exposure ¶1910.95 (5.iii), Rules and Regulations: 48(46), 9777. ANSI (1996). Determination of occupational noise exposure and estimation of noise-induced hearing impairment. S3.44-1996. WESLEY A. BULLA has been teaching at Belmont University for 14 years and is currently Coordinator of Recording Studio Curriculum, Interim Director of Recording Studio Operations, and an Associate Professor in the Mike Curb College of Entertainment and Music Business. Dr. Bulla holds a BM in music performance (percussion), a Masters in Music Education, and a doctorate (Ph.D. Psychoacoustics and Perception) in Hearing Science from the Vanderbilt University School of Medicine. He is both a creative and technical author and has published in AudioMedia-USA, -Europe, and -Asia, Mix Magazine, Hearing Review, and the Journal of the Percussive Arts Society and, as an inventor, holds a U.S. Patent for a Portable Self-leveling Utility Hook used to hold headphones and associated cables in recording studios and broadcast production facilities. Involved in the music industry for over 25 years, he has published songs with 1010 Music, Millhouse Music, and EMI Music Publishing. His engineering and production credits include projects for Liberty, Mercury-Polygram, BMG/ RCA, Curb/MCA, Primer Records, and many independent record labels including: producer-engineer for the critically acclaimed world-premiere recordings of Carl Loewe’s Grand Duo in A Major and Julius Rontgen’s Sonata in E Major (Primer Records, New York), associate producer/engi-neer for award-winning songwriter Jill Colucci’s No Regrets (Liberty Records’ Songwriter Series), and quality control mastering engineer for the double Grammy Award winning Hank Williams, The Complete Hank Williams - Box Set (Mercury-Polygram Records). Most recently Bulla has produced projects featuring the world-renowned Fisk University Jubilee Singers® for Curb/Acklen Records and the BBC’s Songs of Praise TV series. In addition to oversight of Belmont University’s recording facilities, teaching classes, and professional activities, He is currently working on a textbook entitled Music Recording: an introduction to music recording technology, techniques, and historical innovations due to be released in the Fall of 2003.